This is the Ultimate Guide to Robotics Projects. We’ll cover Robotics Projects, past present and future. We’ll also help give you Robotics Project Ideas. You won’t believe some of the crazy things people have made. That said, if you’re a beginner, we can also help get you started. 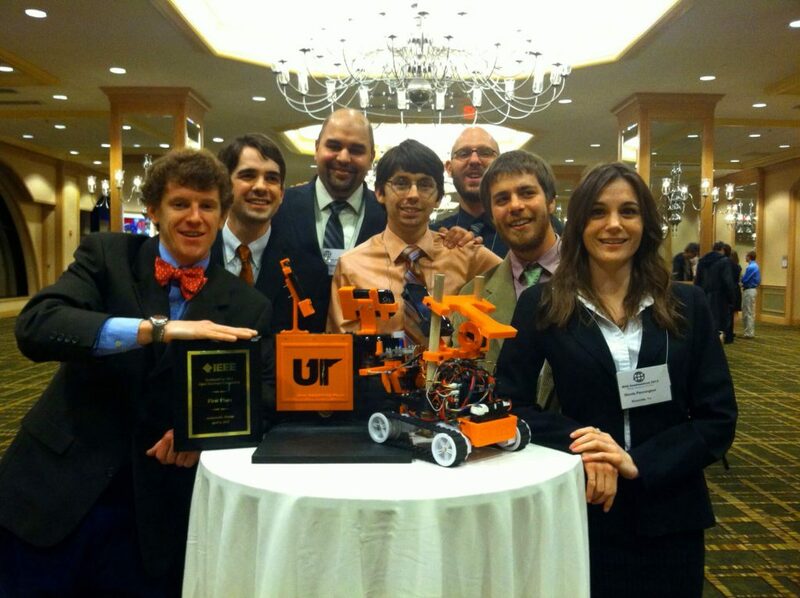 I’m Keith Young – I’ve won multiple robotics competitions, have multiple engineering degrees, and I teach kids robotics. I’ve written this Ultimate Guide to Robotics to help everyone from beginners to hobbyists and college students, and everyone in between. That’s me in the middle. I wrote the vision algorithms in C++. I started teaching myself electronics and programming 27 years ago. TLDR? With a quick glance below you can see if this article is lame or if it has something worth scrolling to. Actually, even that could be too much effort for some people. So I made the bullet points below clickable. If even that is too much trouble then I guess you can just ask Alexa or Siri to build you a robot. But that it outside the scope of this article. This is sort of a hub article and will be updated regularly. In particular, we’ll go more in depth with some of these topics, and also write entire articles dedicated to an individual aspect. For example, we’ll probably write a whole article just on making tank tracks by 3D Printing with rubber filaments. Not yet sure what robotics even is? We get the question a lot. Check out our article on What Is Robotics? Kinvert teaches Robotics and several other STEM topics. We’re really good at it and we love it. We’ve helped a lot of kids with robotics projects. In fact several are scattered throughout this article. If you like this article, you might consider Robotics for Kids and Teens. Another couple classes are 3D Printing for Kids and Teens, and Coding for Kids and Teens. In case you haven’t noticed, we teach a lot of kids and teens. We do it so much we even felt the need to put it in our titles. Even Albert Einstein had to start somewhere. I think. Wait – did he ever build a robot? Anyway you get my point. These are robotics projects pretty much anyone can do, including you. Disappointingly many STEM ‘educators’ don’t go much beyond this or the kit level. So people often get started at the beginner level and never make it past Lego. Kinvert is here to help with that gap between Lego / Scratch and College. We’ll give you some robotic project ideas and also help describe how to make them. Let’s look at some of the common beginner robotics projects. Everyone does this. You essentially hot glue a pager vibrating motor and one of those little wafer batteries to a toothbrush. You can find instructions all over the place. This is very similar to the toothbrush except you add construction paper and those fluffy flexible things. This one is a fair bit cooler and more involved. That said you can do this from home pretty easily. There are a TON of kits out there. We’re here to help you choose which might be best for your robotics project. First, you might want to open the following in another tab. Best STEM Gifts for Kids – Educational Toys. In it we list many of the popular robotics kits. You can learn a fair bit with basic kits like this but in my opinion too many people don’t go past this point. Some of these will still be kit based, but they are at what I would consider to be a hobbyist level rather than just a general consumer level. Once you get to the hobby level, you are able to add sensors. The sensors will give your robot the ability to measure the world around it. With these data, you can now program your robot to make meaningful decisions. To me, this is the point at which you’re truly starting to learn robotics. Sure, start off with the tutorials you can find. Learn to duplicate what others have done. After that, you can start to take on your own projects based on the skills you’ve built. Line following is a very popular thing to do somewhat early on. For some STEM education companies this might be considered advanced, but not at Kinvert. That said, there is a path to get from beginner to pro. I’ve made multiple line followers and I learned a lot. In addition, there are still plenty of applications for line following robots. A line follower does what the name suggests. It follows lines. The simplest it gets is with an Ozobot. However I don’t consider that a robotics project. Next are some basic kits. For example I see STEM education companies using Lego to do line following. With about say 10 lines of code you can program a simple line follower. You can get a little more advanced than this with multiple sensors etc. You can even start to use a little PID – Proportional Integral Derivative. Finally, it can get very advanced with people doing competitions with line followers. It sounds boring, but these things haul. It’s amazing to watch and it makes one appreciate how much effort and tuning must go in to making a robot follow lines so fast. You can go from something very simple to an exciting robotics project with time and practice. This is one of the first robotics projects I ever did. A photovore seeks out light. A popular setup is a solar panel on its back, and a couple light sensors. The robot will turn toward whichever light sensor has the most light on it. In doing so it will scurry around seeking the most light. These are pretty easy projects and are a lot of fun. That said, they do tend to move pretty slowly. Robotic arms are classic robotics projects. There are many ways to make them. A beginner can make a robotic arm out of cardboard and string while there are incredibly complex robotic arms in industry. Long story short, these are great robotics projects ideas! Let’s look at some of the ways most people can make robotic arms from home. First of all, most kit robots are using wheels. This wheeled robots section is mostly dedicated to building your own wheeled robot. Preferably at this stage you aren’t just buying a kit, but combining parts you find. There are lots of ways to make tank treads for your robotics projects. We will write another article on this sub topic since it really deserves it’s own. So for now we’ll summarize. You can buy plenty of different tracks / treads. Some people just use Lego, others buy kits such as the Tamiya kit. They can be 3D Printed out of PLA, ABS, and even rubber. Bipeds cover an absolutely huge range of complexity. On the one hand, you can get fairly simple kits that awkwardly waddle around slowly. On the other, you have things like Boston Dynamics and DARPA contestants. We’ll keep this section short for now. After we get more written on the more user friendly sub categories we’ll come back and get more in depth on bipedal walking robots. Hexapods are robots with six legs. I’ve always wanted to make a hexapod as a robotics project and I hope to find to do it soon. There are a few problems you’ll face with hexapods. This is true even if you are pretty experienced. The main problems are the expense of so many servos, and Inverse Kinematics. Getting in depth with Inverse Kinematics is beyond the scope of this article, but I do hope to write an in depth article on it in the not too distant future. Don’t want to build a robot? That’s fine. You can still learn a fair bit just by coding one. There are several robots out there you can buy that are suitable for this. One of our favorites for this category is the Anki Cozmo. Cozmo can be programmed in Python which is one of our favorite programming languages here at Kinvert. There are some very cool inverted pendulums out there. Some consumer examples include the Segway, and Mip. There are several cool things you could make. The ideas are limitless. We have already sprinkled several ideas throughout this article. However here is our list of some robot project ideas. Robotic Dino – For more information on this check out our article Robot Dinosaur – Ultimate Guide. This article will always be a work in progress. New robots are available every year. We can dive in to sub topics with much greater detail by writing new articles and linking to them. So please check back often. Robotics is an incredibly important topic to learn in this day and age. We encourage you to start small and work up to at least the hobbyist level. Afraid you don’t know how to get started? Check out our article on Kids Learning Robotics from Home.